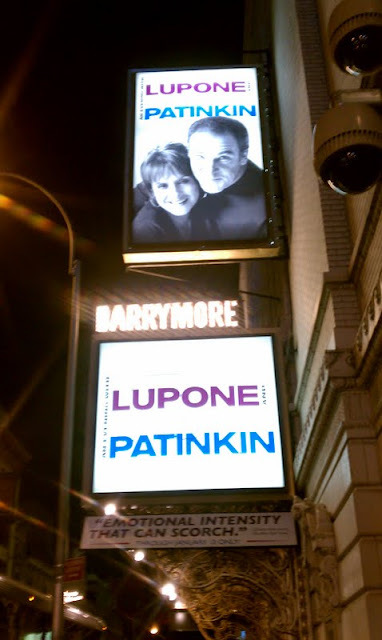 Karigee and I saw An Evening with Patti LuPone and Mandy Patinkin on Broadway last night. Wow! It's such a fun show! It's gorgeous too, even or rather especially in it's simplicity. The two actors are so larger than life, that really nothing else is needed other than Paul Ford on piano, John Beal on Bass, a stage full of ghost lights and really gorgeous lighting design by Eric Cornwell. Patti and Mandy have been friends since they starred in the original Broadway production of Evita in 1979. There chemistry is undeniable and they wear their love and friendship for each other on their sleeves. They only take a few moments to talk about how they met, otherwise, it's all music and scenes from shows, mostly heart-rending, particularly a long scene from Carousel that included "If I Loved You" and finishing with a glorious "You'll Never Walk Alone." They show off their comedy with an office chair ballet, which legendary dancer Ann Reinking gets credit for. I thought I would die laughing, but first I almost died laughing from Patti's masterful spit-take - she is afterall Julliard trained. Most thrilling for me was hearing each of them sing the Evita songs they originated on Broadway - he sang "Oh What a Circus" while she knocked the roof off with "Don't Cry for Me Argentina." Thrilling! I absolutely loved this show. It plays at the Barrymore on 47th Street through January 13th. I saw them in Austin with my friend Angie. It is a great show. Thanks for all the alerts you give me in Austin.